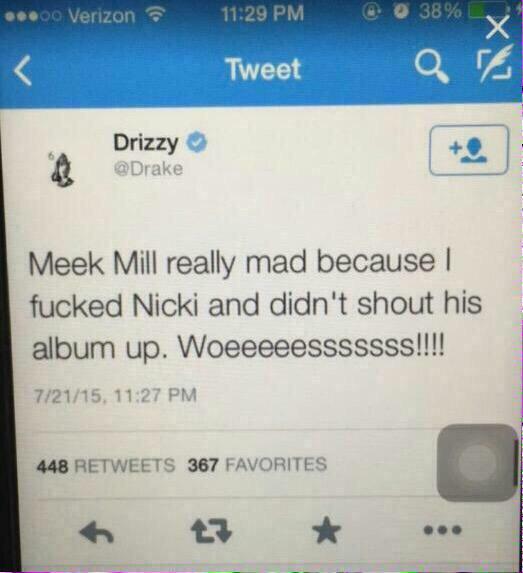 So to start, Meek Mill was pissed of with all the “haters” calling him out about Dreams Worth More Than Money. Given how Meek Mill raps, I’m surprised that he didn’t tweet these insults in all caps. Anyway, he accuses Drake of having a ghostwriter. He then throws a tweet that says “Quentin Miller.” Quentin Miller has been credited on previous Drake records as a producer, so it’s not totally impossible. And a fire rhyme from Meek Mill. So if the allegations are true, what will that do to Drake’s rep? Other rappers such as Dr. Dre and Kanye West have publicly stated that they don’t write all of their own raps, so Drake might be in the clear. Posted in Alec Gustafson, Features, Hip Hop/RapTagged drake, fight, fire, meek mill, musicBookmark the permalink.